I'm delighted to see such a large attendance at this press conference. 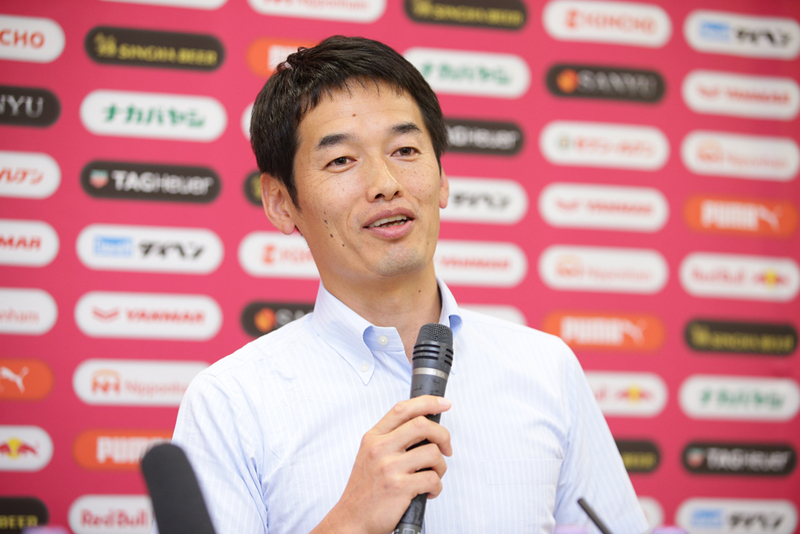 To begin with I'll fill you in on the background of this project, then Mr. Miyamoto, representative director of Cerezo Osaka Sports Club, will explain the details. I took office as President of Cerezo (Osaka Soccer Club Co., Ltd.) on February 1st this year and since then I've tried many things. One of them is a medium-term project that all the staff will participate in between 2015 and around 2020. We will gather opinions from young people and discuss what we want this company and this club to be in the future. Our main task this year is of course winning promotion to J1. We are not sure about the outcome yet, but are already thinking about what we have to do after gaining promotion. Also the manager always says, "we don't want a team that will go straight back down to the second division, but want to create a team that can keep fighting in the top flight.” This goal is shared by everyone at the club. In the five years up until 2020, after returning to J1, we want to create a team that will always be aiming to participate in the ACL (AFC Champions League). And today the J.League will announce its license conditions for the next year. Currently we have two stadiums, Yanmar Stadium Nagai and Kincho Stadium. The former is an athletics stadium, the latter is a ball-game ground. Since 2012, in the "Stadium" provision of J.League regulations, it is stated that ball-game venues are desirable. I think this implies that in the future athletics stadiums will not be acceptable. In the past we have also played some ACL games at Yanmar Stadium Nagai, but there is actually one aspect of that stadium which doesn't satisfy the J.League's stadium conditions, and that is the number of toilets. Other stadiums also fail to meet certain conditions like number of toilets or the presence or absence of a roof, but unfortunately at Yanmar Stadium Nagai there are far less toilets than required. I think today they may list "Yanmar Stadium Nagai (Cerezo Osaka)" as one of the clubs that is lacking in that department. Keeping in mind that we will always try to play in the ACL, we have to satisfy all stadium conditions. The current Kincho Stadium barely satisfies all the conditions, but in aiming to become a strong and popular team, we want to have a higher seating capacity in the future. Conceptually speaking, what we want for the future is to have a club and stadium that are firmly based in the local area and indispensable to this city. One of the projects to help achieve that is the "Cerezo's Forest Initiative". Simply speaking, we want to be "our city's club, our city's stadium". In August I visited four cities in the Netherlands and Germany for a business trip. Even a small village with a population of about 2,500 people has a football-exclusive stadium. The stand is not so big but there is a small clubhouse with restaurants and the people can watch games with a drink. In a slightly bigger city, like Amsterdam, there is a main stadium with a capacity of aorund 3,000-5,000 with a cafeteria and a restaurant, and you can watch games while enjoying lunch or drinking in the bar. At that location there were surprisingly seven football training grounds in total. At the stadium in Leverkusen, I found a business catalogue for the use of the stadium, which included, for example, "we have these meeting rooms," "we can offer you this place for a concert," "there is also this restaurant," and so on. It may be in the distant future, but we want to realize something like this. Mr. Miyamoto will tell you later, but I think that is what’s expected in the J.League’s "One Hundred Year Vision". We first repaired Kincho Stadium in 2009. The first renovations took place then, the second began from 2011, and this time will be the third renewal. The idea is to regard the development of the stadium in the same light as the development of the club and that of the local area, and we want to make it bigger step by step. It's not something that can be realized in a day and we need assistance from the municipality and a large budget as well. We can't start and finish quickly. 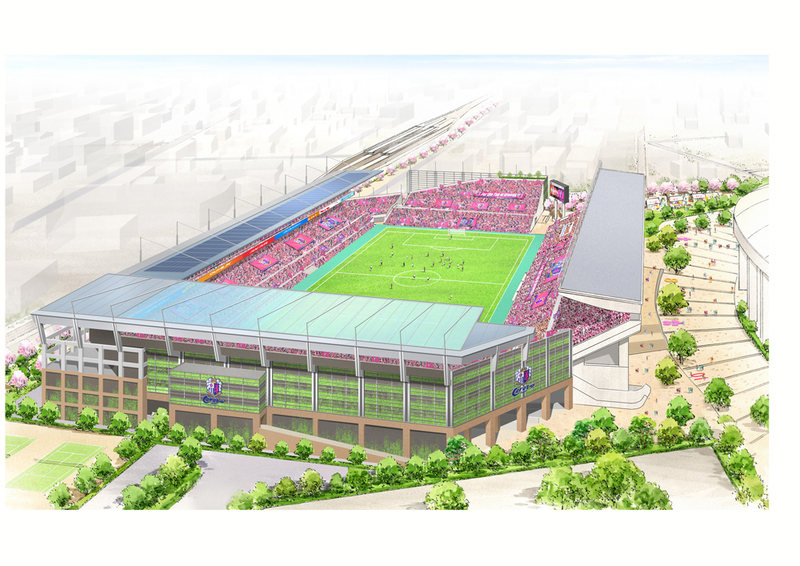 Some time will be needed, but this is "Cerezo's Forest Initiative," or, "New Kincho (Stadium) Initiative". I would like to give you a general outline regarding the renovation of Kincho Stadium as a stadium of development. We need to improve the stadium in the correct manner. Currently we don’t have the means to build a new stadium, but it is easier to repair the current venue section by section, separating into main stand or back stand etc. That is why we selected that method. It cost over 400 billion Japanese yen to build Yanmar Stadium. The costs would be huge if we were to build a new stadium like the new national stadium in Tokyo. Therefore, we will instead focus our strength as a club on repairing each part gradually. In other words we can say we will ‘feed’ our stadium. We are giving our all to develop, and so it is fitting to refer to the stadium as one of development. Nagai is located in the heart of the city. We repair it as a metropolitan complex stadium. This is Cerezo's Forest Initiative. Here I reveal the four key points. We will repair gradually using the current structures. We will use the current main stand and repair the back stand and seats for away supporters using the seats behind the goal. We will carry out the repairs gradually and may well renovate the main stand one day. That is Cerezo's Forest Initiative. 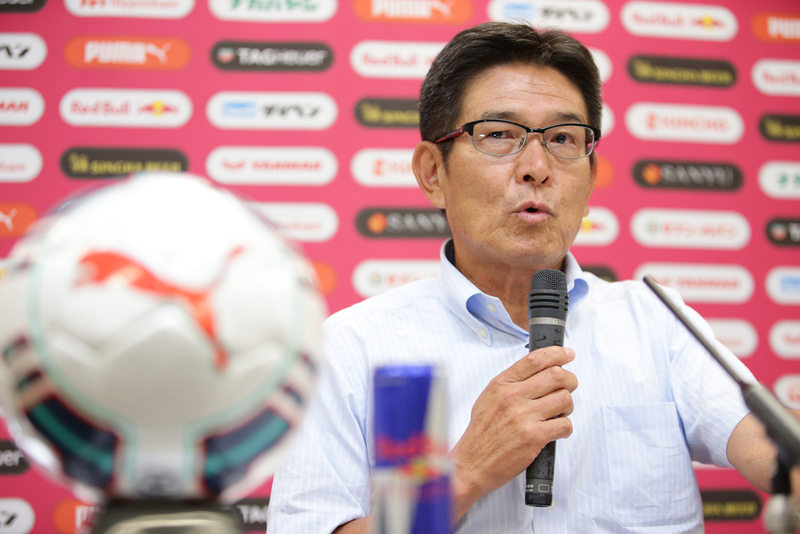 We want to plant cherry trees around the stadium and make Nagai Park a comfortable one filled with green, which we will call Cerezo's Forest. Of course we will introduce the latest technologies to our new stadium. However, we want to make it a familiar stadium that benefits people and the environment using Japanese wood. There is no track around the pitch, which helps to make a good atmosphere in the stands. The voices and desire for victory of the supporters will touch the players directly. We will make such a stadium. As you know, the stadium has a viaduct at its rear and so there is not so much space. With that in mind, we will have tiered stands but make them closer to the pitch. Kincho Stadium has steep stands which is good for fans when watching games. We would like to make them closer with the three-tiered stands. We will also aim to provide good services and facilities for children, elderly people, couples, and families etc. to enable them to enjoy the stadium. Our stadium with its forest will be good for everyone. Our stadium should function as a location of disaster prevention. This is true of Nagai Park and will also go for Kincho Stadium, as well. It will help to ‘make a town. It is an urban stadium so will serve to enliven the town itself. The stadium will contain several facilities for nearby residents, and we would like it to cater towards children and serve as a cultural and entertainment hub. It should fulfill the demands of residents and encourage them to gather even on days with no games. The urban stadium must play a role as a helpful location for local people. That will ensure that the stadium is ultimately a good investment. The stadium should be beneficial for our supporters, so we have to listen to their opinions. We are currently the only club in the J.League that runs an official fan site, so we will use that to hear the voices of our fans. We plan to have around 40,000 seats. We have to consider our budget, but we that is our ideal. We estimate that the cost of repairing the back stand and the stand behind the goal will be 5 billion Japanese yen. We would like to gather that 5 billion yen via donations and subsidies. Of course we will also utilize our own budget as well, but donations will be vital and we will cast around widely for them. We will conduct the repairs and after completion will donate the stadium to Osaka City. Then we would like to lease the stadium for a long period. We will discuss the precise details with Osaka City. 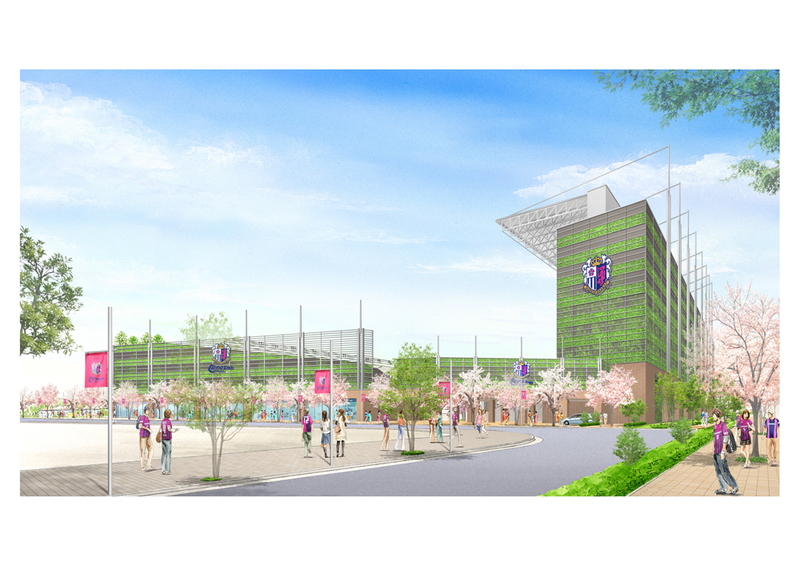 The group to which Cerezo Osaka Sports Club belongs as a representative was chosen as a designated administrator of Nagai Park. We will start to work as an administrator for 5 years from 1st April next year. 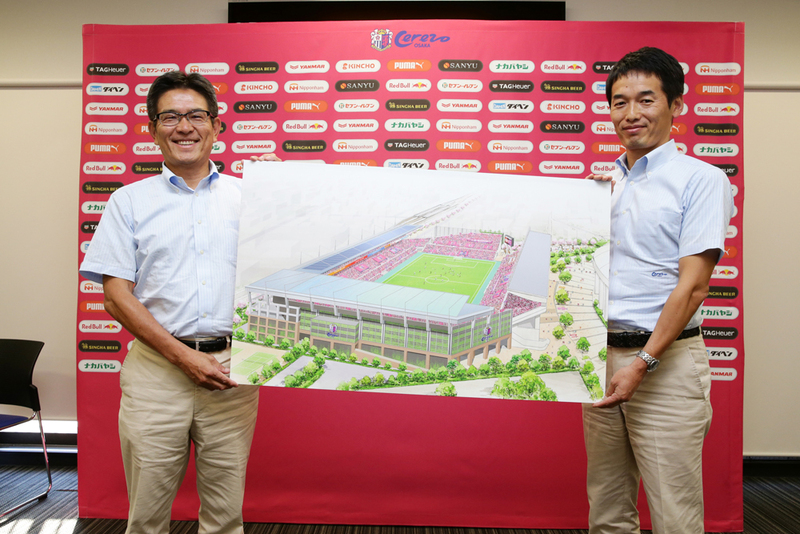 That means we will serve visitors to Nagai Park and also inform them about Cerezo and the improvements to the stadium as well. Q. Was this plan conceived before Mr. Tamada became president? Tamada: I heard that when the turf of Nagai Stadium was replaced with a natural one for football in 2009 that this plan was in place. We carried out some repairs in 2009, 2011, and 2014, but I have been keen to get this project up and running. Q. Will this project proceed as described, or is there a possibility of some changes being made, such as adding a roof? Miyamoto: We will put a roof over the whole area we will repair but not for the main stand or areas behind the goals this time. If we manage to raise extraordinarily large funds then the plan could be revised, but we will proceed with the project carefully. Q. Can the distance between the pitch and the stands be any closer than it is currently? Will the roof not have an effect on the grass on the pitch? Miyamoto: Firstly, I have to say that this stadium will not only be used for football. It can also be used for rugby or American football. With that in mind, we will ascertain the closest distance possible to meet all required conditions. We will have a translucent roof on the south side, which will provide enough sunshine for the grass. Q. What is the most appealing thing as an urban stadium? Miyamoto: As a modern football stadium we serve meals and alcohol to our customers. The stadium will also contain appealing facilities to keep visitors entertained on non-matchdays, such as a golf simulation centre in the lounge. Restaurants or function rooms are also options. A climbing practice facility could bring children to the stadium. The joy of children is the best thing for local people, so we see such facilities as a prerequisite. Q. You mentioned the year 2020. That is the year of the Tokyo Olympic Games, is there any connection there? Tamada: We don’t have specific concerns regarding that. There are still some undecided aspects. Q. Have you received any requests from the players? Miyamoto: They don’t have any requests regarding the repairs, but prefer to use Kincho Stadium rather than Yanmar Stadium, saying that results last year could have been better if they had played more at Kincho. They said they can hear the supporters voices and feel their support even more, giving them encouragement and power. Our key motivation is to build a stadium aiming for unity and familiarity between the team and the supporters. Q. What kind of dream do you want the supporters to share? Tamada: Of course they want the team to be stronger, but we would like to aim to make our club bigger together, step by step. We have to conduct these plans bearing in mind the opinions of local residents and our supporters. Q. A stadium with 40,000 seats can hold international competitions. Do you have any intentions in that respect? Tamada: We have to consider carefully whether we are able to have 40,000 seats. International football matches and tournaments have been held at Yanmar Stadium Nagai so far and the Club World Cup will be hosted there this year, but we don’t know what will happen in the future. Our objective, however, is to achieve a standard that qualifies the stadium to hold international matches. Q. If that is achieved it means we will have two new stadiums which can be used for international matches. What effect will that have on football in Osaka? Tamada: The only big football stadium is located in Saitama. There are mid- or small-sized ones constructed in Kyushu and elsewhere. I believe there should be ball-game stadiums all around Japan, so it is no problem to have two or three large football stadiums in Osaka. We deserve to have them in our region. Q. You plan to repair the stand behind the goal for the away teams’ supporters, how about the one for the home team’s fans? Miyamoto: The current back stand will be reconstructed to become the main stand. That means that the current stand used by away teams’ supporters will become the one for the home fans. If we repair the current main stand in the future that could be changed. Q. How long will you ask for the donations aiming for 5 billion yen? Will you start the repairs next year? Miyamoto: If we aim to complete the repairs by 2019 then we have to start in 2017 at the latest. We need a budget in place to begin but don’t need to pay all costs before the renovations start. We must have the right plan to pay the costs logically. The donation process will begin once the preparations are complete, which we hope will be as soon as possible. We will then proceed with the repairs bearing in mind the situation regarding donations and our budget. We will continue to ask for donations until the repairs are completed. Q. If the donations are not enough will the repairs be cancelled? Miyamoto: In that case, we will utilize more of our own budget to begin the renovations. We have several options, like extending the deadline. Q. Is the next step to have 40,000 seats? Miyamoto: This image means the stadium must have approximate attendances of 40,000. We still don’t have a concrete layout so can’t say exact figures. If we can realize our plan of spending 5 billion yen then 40,000 seats can be achieved. But we have to decide if we prefer facilities or seats, for instance, so cannot present concrete figures and images at this time. Either way, there will ultimately be 40,000 seats or thereabouts. Tamada: The current main stand has a high ceiling and would cost a lot to demolish, so we have to decide if it is necessary or not and consider our repair project carefully.